The below link may help to get some idea about Keyword driven testing. In case of keyword driven testing, we need to do proper planning and initial huge effort. Anyway it will give benefit of easy maintenance and easily adding more test cases/scenarios. Here we can change any of the three things to create test steps. Regarding your question, the framework design will purely based on your requirements and your way of thinking. There is no Solid rule to follow. Personally, I would like to have my own framework (hybrid framework) designed according to my own requirements. Anyway, the best practice is, we should create below sub folders in your root folder. ObjectRepository-> To keep your shared object repositories. Datatables->To keep QTP data tables and external Excel sheets. RecoveryScenario ->To keep your recovery scenario files. Tests-> You can keep your QTP Tests here. You may include Test containing Reusable Actions here. And a Test which is getting used as driver script can also be stored here. library->you can keep your vbs file which contains vbscript functions. Results-> You can store Result files (Either QTP result file or customized result file) here. Note that the above thing is NOT answer for your question. Just I am trying to explain that there won't be any solid rules/approach for creating QTP framework. One of readers of our QTP knol has asked about Disadvantages of Descriptive Programming (DP) in QTP. The main disadvantage of Descriptive programming is Maintenance issue. Since Object repository will be stored in centralized place, property definition for any Object can be easily changed at any time if the application developer changes the property of the actual object/control. But, in descriptive programming (DP) it is difficult to change the object property as each QTP developer will be defining object property in many places using DP. For example, assume that you and team member are developing automation test scripts for testing gmail application. Gmail login script will be used in many test scenarios. Assume that you are automating some scenarios and your team member is automating some other scenarios. In case of Object Repository, you and your team member will be forced to use same object description for login page controls/Objects (e.g username,password, login button). So in future if Google changes any property (e.g change the button name from "login" to "get into gmail"), all the scenarios can be easily updated just by updating this change in Object repository. But in case of DP, there is a possibility of defining the login button in multiple places. One definition by you and another by your team team. (Anyway proper Team Coordination will avoid this issue, but practically it is very difficult to achieve this coordination.). So, comparatively updating DP style coding is bit difficult if the application properties got changed. We have included new features to our Quiz. Most of the changes are in Admin and Quiz Creator logins. We will provide more features for Users in our next release. You can see the Quiz results of other Users to know about Popular Quiz Topic. Quiz Creators are provided many options such as searching existing questions using Keyword and based on Quiz Creator. Our next release will mainly focus on displaying links of relevant articles if the User's Quiz score is less in particular area. Say for example, if an user attends PHP Quiz, and he made many wrong answers for php array related questions, our code will find good articles related to php array and will display the links for them at end of the Quiz. In my many previous posts, I have explained about using setAttribute method for dynamically creating Webpages. But we faced some issues when we tried to use setAttribute for dynamically changing the CSS style class name for a div tag. i-e We tried to use below code for setting "current" as CSS style class for a div tag with id "desc"
The above code worked in FireFox. But it didn't work in IE (Internet Explorer). We came to know that we should use ‘className’ instead of 'class' in IE. Contact us if you face any difficulty in seeing News. Read below the Latest Tech News in Tamil. It is getting displayed by collecting News articles from RSS feed of the Tamil blogs and Tamil News Sites using Yahoo Pipes and Google Feed burner. We are NOT reviewing/monitoring these news items.They are getting displayed automatically using RSS feeds. Contact us if you want to include or remove RSS feed of your blog/site. Follow @TamilTechNews to get Tamil Technology News at Tweets. Google SMS Channels is a free SMS service provided by Google in India. If you are in India, you can subscribe to any SMS Channel for getting news/updates to your mobile as free SMS. Doing Subscription for any SMS channel and adding your own SMS channel is very easy. First, search for your desired Channel and you can subscribe to the selected channel by giving your Indian Mobile number. Google will send you verification code to your mobile. You can complete the process by entering the verification code in the site. You can unsubscribe this service at any time easily. And, you can make many settings to get the SMS at your convenience. It seems currently it is available in India only. And, for creating your own channel you have to give the channel name and url of your blog/site or url of RSS feed. Google is providing Invitation only subscription to keep a private channel within friends and family. And, it supports Unicode also. So you can get SMS in multibyte language (e.g Tamil) also if your mobile phone supports Unicode. As of now, we have created Three news channels. IPL_News- Get News and scores for IPL cricket matches. As of now Cricket updates is having more number of subscribers. Even we can find SMS Channel for getting alerts about Tsunami. max-width is the property used for limiting the width of the image to predefined value. So it will help to show small sized pictures to display in their original size while resizing the large-sized images into a predefined maximum width. By doing this we can keep avoid any misalignment of web page due to large-sized images while keeping quality of small-sized images. But this max-width property won't work in IE 6(Internet Explorer 6). So we can use the below workaround to make it work in IE6 also. The below style will limit the image width to 300px. Today we can see that the Google Doodle logo is showing an image representing electromagnetism. Google is showing this image for celebrating birthday of Hans Christian Ørsted. who was born on August 14 1777. For many his name is not known but one of his experiments was instrumental in the development of electricity. He is a Danish physicist & chemist. He has initiated the concept of electromagnetism. i-e He found that there is some relation between magnetism and electricity. It is the basis for invention of Electricity Generators and Transformers. According to the national Museum of Denmark, Ørsted is poet too. He actively contributed to the modernisation of the Danish language. It seems Google is showing interest to spread knowledge/information about historic persons and Scientists. Guardian says that "Probably not even the physics geeks remember much about Hans Christian Ørsted, although Google's Doodle logo illustrates his key discovery"
Mashtable says "Google’s “doodles”, their creative renderings of the Google logo celebrating famous figures and significant events, have the ability to draw worldwide attention to under-appreciated historical figures". You can read more about Orsted from Wikipedia.. 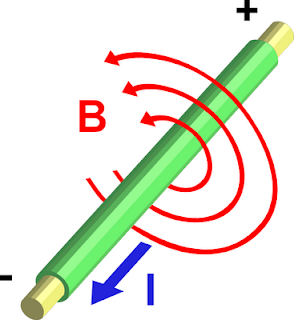 The basics of electromagnetism is "A changing magnetic field produces an electric field and similarly, a changing electric field generates a magnetic field. Google has announced that it will acquire On2, a leading developer of video compression technology for $106 Million. "Today video is an essential part of the web experience, and we believe high-quality video compression technology should be a part of the web platform" said Sundar Pichai, Vice President, Product Management, Google. "We're thrilled that On2 is joining one of the world's most innovative companies" said Matt Frost, interim CEO of On2. Google has decided to acquire On2 for improving performance, quality and effectiveness of YouTube in HTML5 capable browsers. We know that HTML5 is supporting <video> tag which has the potential to liberate streaming Internet video from plugin prison. There is an expectation that Google will decide to open-source On2’s VP7 and VP8 video codecs, and it will become an alternative to the proprietary and licenced H264 codecs. Goolge may force its users to upgrade to HTML5-compliant browsers instead of using Flash formats. So it will give double benefits for Google, one is improved YouTube performance, another is promoting Chrome which is already HTML5 compliant browser. And,On2’s video compression technology also extends into the mobile electronics world of gadgets. So it will help Google to promote its Android against Apple iPhone. YouTube is having test page for showing demo video in HTML5 capable browsers. What does Google see in On2's video tech? Why Google wants to acquire On2 Technologies? FCC (Federal Communications Commission) has sent letter to Apple for asking reason for its ban on Google Voice and other Voice related Google applications in iPhone. And, FCC has asked more details about this issue from AT&T and Goolge. Find below the content of letter sent to Apple. By seeing this url we can understand that this site is developed using php, and we can understand coding/database table upto some extent. For example, if you change id value to some invalid value instead of 10 we will get some error message/query which may give some details about database table. So, the hackers can easily attack this server. Assume that this url is used for showing article about "computers", the search engines such as Google and Yahoo are not having any clue to show this topic when user searches "computers". And, many Search engines won't index this page, because they couldn't read the url after the "?" mark. Similarly for users also it is difficult to remember that the id "10" is for showing the topic "computers". 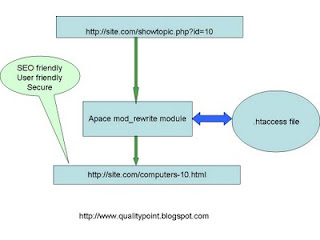 mod_rewrite extension of Apache can be used for making this url into another format which will be more safe, search engine friendly and user friendly. This new format will be user-friendly. Because, the user can easily select/identify this url from browser address bar if they have already visited this url. It will be search-engine friendly, because there is no "?" in this url, and it includes keyword "computers". It will be more secure, because the attacker can not predict the technology (php or asp) used for developing this url. Mod_rewrite is really powerful if you are familiar with the regular expressions. mod_rewrite should be enabled in your apache server for creating this SEO friendly url or pretty url. You can verify it by displaying phpinfo(); in a php file. If it enabled then mod_rewrite will show as loaded module in phpinfo. If it is not enabled, you should enable it by doing below steps. First you need to create a file called .htaccess and place it exactly in the folder where you want the rewriting to take effect (it will also take effect over all subfolders). * In case you already have a .htaccess file you can simply add the lines to it (if it already has mode_rewrite directives you can mess them however). Here "RewriteRule" is static text, i.e. you should not change. "rewrite_from" is the address which will be typed in the browser and "rewrite_to" - which page the server will actually activate. Below are some examples which should make the working of mod_rewrite clearer. www.domain.com/index.php but you want to pretty url like this for SEO friendly, www.domain.com/index.html. - L Tells Apache to not process any more RewriteRules if this one was successful. Lets go to see if the urls have query string parameter, how to handle it. We should start from more specific condition and should end with more general condition while writing regular expressions. We used mod_rewrite for creating pretty url in our score results project. Some hosting companies won't enable mod_rewrite in their servers. 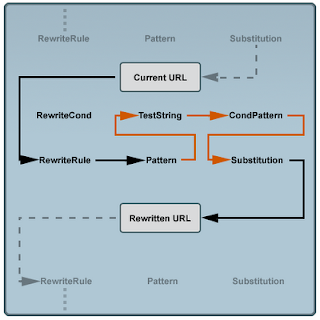 So, in this case we can not use Apache mod_rewrite for creating SEO friendly urls. In this case, PHP rewrite can be used as mod_rewrite. Find below some other articles about mod_rewrite.